Introducing AmpliFi Gamer’s Edition. The latest edition to the AmpliFi product line by Ubiquiti Networks. 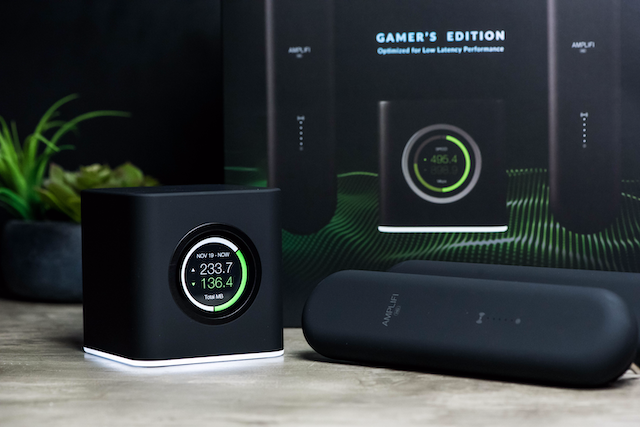 Optimized for cloud gaming services, including NVIDIA’s GeForce NOW free beta, AmpliFi Gamer’s Edition delivers incredible network speeds with low latency online gaming performance. With turbocharged 802.11ac Wi-Fi mesh technology, AmpliFi HD Gamer’s Edition utilizes multiple self-configuring radios and advanced antenna technology to deliver powerful, whole-home Wi-Fi coverage. The AmpliFi HD Gamer’s Edition is equipped with a GeForce NOW QoS mode, developed by Ubiquiti with NVIDIA’s support to quickly adjust networks for optimal game streaming performance. The QoS implementation offers gamers a simple solution for detecting latency or frame loss issues, resulting in a top-quality experience when other traffic is present on the network. AmpliFi Gamer’s Edition is specifically designed to deliver low latency, high performance whole-home Wi-Fi to gamers across all platforms: online gaming and streaming, e-sports, and game consoles. The touchscreen display, black exterior and LED lights make this system a showcase piece in your home. Newly designed MeshPoints rotate 270 degrees for optimal positioning for concentrated signals to your devices, which means stronger and faster Wi-Fi. AmpliFi Gamer’s Edition will be available for $379 USD through the AmpliFi store (Amplifi.com) beginning Wednesday, November 21st. The kit comes with the Gamer’s edition Router and two MeshPoints. Standalone devices from other AmpliFi products lines, Amplifi HD and AmpliFi Instant, can be added as additional MeshPoints to the AmpliFi Gamer’s Edition system. Standalone devices from other AmpliFi products lines, Amplifi HD and AmpliFi Instant, can be added as additional MeshPoints to the AmpliFi Gamer’s Edition system. This presumably means that I can't add a Gamer's edition router to my existing "non-standalone" kit? Very poor marketing, if this is the case. Will we be able to add the GeForce NOW QoS mode to existing AmplifiHD's??? Hi @ubnt-brett - do the Gamer routers actually have any new (better) internal hardware (radios, antennas, processors, ram, etc.) compared to HD's or is this just a firmware upgrade? It seems like the Gamer MeshPoints could still be essentially the same as the old ones with a new mechanical hinge design instead of the magnetic ball. Will the rest of us HD owners get all of the firmware improvements (except maybe GeForce NOW QoS mode if that is what the product differentiation is)? Will you offer Gamer routers or MeshPoints for sale stand alone? @dave-martin No the update will not be something implemented into the HD product line, it is specific for the Gamer's Edition. The firmware will also be different and adjusted to better fit the needs of gamers and online streaming. Hi @ubnt-brett - does Teleport still work with the Gamer's Edition? @derek-saville To my knowledge it does not at this time, however this will be something that is implemented. I will update once I have more information or if this changes. @derek-saville The overall hardware of the router is the same, the difference in the mesh points are new design with rotating outlet, as well as the detached magnet power supply has been removed. Also, the antenna in the mesh point is omni directional so you no longer need to worry about pointing the mesh points. As of right now the Gamer's Edition is only sold as a kit, but I will update if/when any changes are made. Can't wait to buy one... After which, you guys will release the HD Gamer Pro, which has better performance than the HD Gamer. Then I will be upset, having not waited for the HD Gamer Pro. Other's will flaunt their Pro, while I only have the regular Gamer HD. Sadness will take over until a couple on months later, when the HD Gamer Extreme is released! All you Amplifi vanilla owners will be jealous loosers! @ubnt-brett This looks like a wonderful product for those who need a new router for their gaming experience. However, I have an original AmpliFi and it is quite difficult to purchase one if my current AmpliFi would be useless sitting in a box. Would you soon have a program to Trade in current AmpliFi for a discount price to the Gamer's Edition system? It would be neat. I hope having fragmented product lines doesn't mean less attention to the existing products. Does this mean the existing line will not get any other version of QoS outside of what already exists only for WiFi devices? My $0.02 of speculation (FWIW) is they are using the nVidia GeForce NOW network (hence the partnership) for continuous reliable speed and latency testing and using that real-time data to tune QoS on the fly for gaming / streaming, plus some firmware optimizations from Turbo mode. Hopefully some of the QoS tuning options will filter down to us HD users, sans the real-time feedback loop. But I doubt the nVidia based GeForce NOW QoS mode will ever be enabled on regular HD models. PS - for the QoS magic to work the Gamer's Edition router probably must be the main router. So a 'kit' could very likely never be meshed to one, even if they sold the GE router standalone - they are mutually exclusive to each other. And we will probably just see white standalone 2nd gen 270° MeshPoints released and added to the regular HD kits at some point. I thought the regular HD mesh points were omni-directional as well? If not, what is their radiation pattern? @derek-saville Thanks! I had actually read that. I am just wondering how the omni antenna in the gamer edition is an improvement to the mesh points if, as described in that article, the current mesh points are advertised as best of both worlds. Hi @nick-transier - since they eliminated the magnetic ball for aiming the omni directional antenna is probably a better compromise if your power plug isn’t naturally pointing at your target. This is kind of nifty, but is there any word on QOS support for wired devices? That would do far more for my gaming issues than any Nvidia tweaked QOS for Wi-Fi devices. E.g. any time I’m trying to play a game and my wife plugs her iPhone in to charge, resulting in my poor ADSL’s 1Mbit upstream being saturated by iCloud backup, leading to packet loss as I have no way to prioritise my wired desktop’s connection over her phone. @ubnt-brett The updated mesh points are really nice, is the Amplifi HD kit going to be updated to this same style as well?